A network of walking streets for tourists, bicycles for rent all over the city, and parks as educational centres are all signs of a new, friendlier attitude to pedestrians. The face of Moscow is changing at a blinding pace. Parks are being redesigned; trees are being planted; and a network of pedestrian streets is being created. What has prompted this surge of activity? Experts put it down to world trends in tourism. In a few days Nikolskaya Street, which leads to the Kremlin, will become a pedestrian street. Construction work is going on round the clock as new granite tiles are being laid. Once that is done new street lights, benches and tourist signs will be put in place. Moscow Mayor Sergey Sobyanin said the other day that last year saw a record number of tourists, with five million people visiting the city. Experts predict that the figure will increase by a further half a million this year. The city’s infrastructure must change if it is to be able to handle such a massive influx of visitors. Changes are happening before our eyes. Back in May, the Moscow Mayor announced a full-scale programme to create pedestrian areas and plant greenery. By autumn, 30 new pedestrian areas will be ready. Asphalt will be replaced by granite tiles and tourist signs will be put up. After reconstruction, all these routes will make up an extensive pedestrian network. Twenty neglected mini-parks in the Garden Ring area are being planted with greenery. 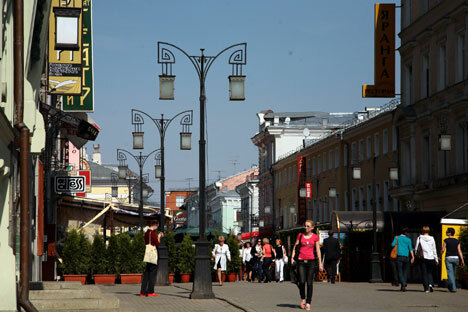 The new tourist network, according to Sobyanin, will be under the jurisdiction of the city’s Department of Culture, which means it will be protected against commercial development. Gonsales, curator of the recent Green Moscow exhibition organised as part of the Moscow Architectural biennial ArchMoskva, introduced, together with the Wowhouse group of young architects, the Green Loop project, a multi-kilometre pedestrian route along the Moscow River embankments. Much has already been done. Architects have proudly unveiled a new river station Vorobyovy Gory where popular city excursion boats stop. The Green Loop project is part of a larger city project being run by the Moscow Department of Culture and aimed at modernising Moscow’s parks. The head of the Department, Sergey Kapkov, began park reconstruction when he was the director of Moscow’s famous Gorky Park. In his new capacity as chief of culture in Moscow, he enlarged the project to include most of the capital’s parks. Big Moscow parks such as Gorky Park, Sokolniki and others, which used to be semi-neglected parks with rusty amusement rides and cheap beer, have turned into modern areas with lecture halls, children’s hobby clubs, yoga classes, outdoor restaurant terraces, art installations, modern live music on outdoor rinks and bicycles for rent. enlisted the services of the Danish urban planner Jan Gehl to advise on improving the city’s streets. This summer, after spending a year and a half studying Moscow on commission of the city government, he presented a full-scale report on how to transform the city. He was previously consultant to dozens of cities in various countries. In Gehl’s opinion, the city should be friendlier to pedestrians and bicyclists. He has proposed a multi-point programme to reduce the number of cars, remove obstacles in the streets, make underpasses, link up all the Moscow boulevards, make squares more attractive for pedestrians, turn embankments into pedestrian areas, maintain active city life in winter and develop a bicycle infrastructure. The Moscow Government has already taken some points of the programme on board. If the current trend is sustained, Moscow will soon become one of the most attractive tourist cities in the world.